Photo by The New York Tribune, dated 12 September 1915. 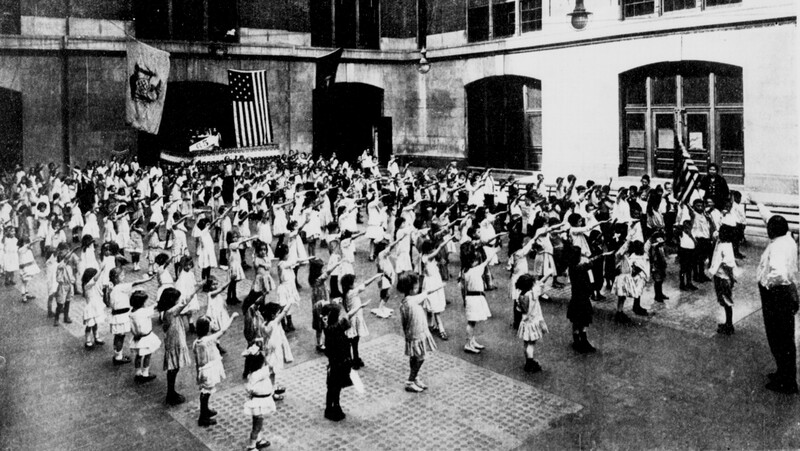 The Bellamy salute is the salute described by Francis Bellamy (1855–1931) to accompany the American Pledge of Allegiance, which he had authored. During the period when it was used with the Pledge of Allegiance, it was sometimes known as the “flag salute”. It was officially replaced by the hand-over-heart salute when Congress amended the Flag Code on December 22, 1942. The average school year is 180 days* out of 365, or 49% of the year. Over 12 years (180 days X 12), that’s 2,160 days of school. That’s 2,160 times you have been “taught to” / forced to / brainwashed to / obligated to swear an oath / swear yourself to / “pledge allegiance” to a flag and the republic that flag represents. You have, whether you knew what you were doing or not, sworn yourself to the flag of the United States and sworn yourself to its government 2,160 times. Dwell upon that for a moment. Now, most places or schools you go to don’t play the national anthem every day, but you’re constantly exposed to it, especially through sports activities both at school and on TV throughout the year. I’m going to focus only on sports for this example, since it’s the most common. Let’s say that in a year you watch 52 games total at school and on television, which is one a week and not unreasonable. Over your 12 years of school (52 X 12), that’s 624 times you’ve heard the national anthem and watched people stand with their hand over their chests, venerating it, singing it, been taught to or forced to stand and put your hand on your chest for it yourself, and even taught it and to venerate it and respect it at school. Think about that for a moment. Let’s say your family are religious practitioners and their religion, as is most often the case, meets once a week for mass, preaching, praying, scripture and other religious teaching and related activities. As with the national anthem example, you’ve been to church 52 times a year for 12 years, so it comes out the same at 624 times throughout your 12 school years. Put that into perspective for a moment. You have experienced the national anthem in all its veneration and glory the same amount of times you’ve experienced your religion in all its veneration and glory. So which do you serve and which are you programmed to follow? You might answer that they are not incompatible, and that you’ve sworn yourself to God and your chosen religion. That’s fair enough, but you’ve actually and literally sworn yourself to the flag and to the government it represents exactly 2,160 times in those 12 years. How many times have you sworn yourself to your god and religion in that time? Just in terms of practice alone, (2,160–624) you’ve venerated the flag and the country 1,536 more times than you have openly and physically venerated your religion, and that’s without adding the 624 times of the national anthem, which returns the number back to 2,160 MORE times to the country. “America” or more accurately, the United States of America, is a religion in itself. It’s our true religion, with its corresponding celebrity saints, which represent what we do or should aspire to be: rich and famous. Rich is the most important of all, though, because we are all obligated in our American religion to worship money, those who have it, and the acquisition of it. 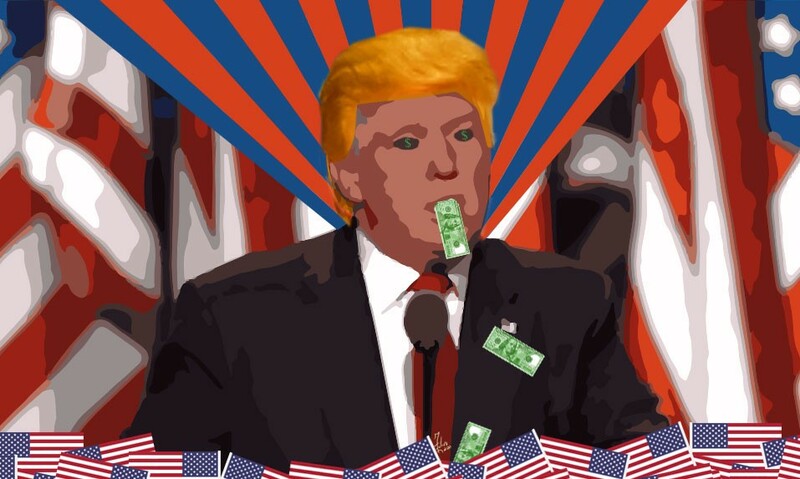 This is why Trump, who has built himself as a symbol of money, could convince otherwise reasonable people to vote for him in spite of their reservations about his character. True or not, we revel in that. We love to use terms like, “leader of the free world”, “greatest country in the world”, “the only superpower”, amongst others. We hear them from our representatives (preachers / disciples), from TV shows (hymns? ), even in some of our churches. Our focus is always on us and how great we are, while everyone else can only wish they were us. Everyone else wants to destroy us because we’re so great. Our American religious programming has us worshiping the country and punishing those that dare question it, its values, or its symbols. God bless America and NO PLACE ELSE. We spend so much of our time trying to convince ourselves and everyone else about how great we are, that we leave no time to realize that perhaps, we’re not that great, and in many areas, never were. If we spent half the time we spend sucking our own dicks on actually trying to become as great as we say we are, we’d be great by now, but it’s more important to punish those who criticize our religion than actually listen to their grievances, analyze their merit, and if valid, try to fix them. "Vietnam had a huge influence in our religious devotion to ourselves. Losing the war brought great insecurity to the nation and we’ve been compensating for it ever since." God forbid someone protests the anthem, the pledge, or any of the tenets of our religion of greatness, or worse, dares to question our religion, for then the full weight of our worshipers shall cast fire and brimstone down upon them through Twitter and every other outlet at their disposal. How dare they criticize our religious symbols of greatness? How dare they “petition the Government for a redress of grievances” as outlined in the Constitution of the “Republic for which it stands”? It’s true we’re great at many things, but we’re not so great at others (here’s looking at you healthcare, treatment of our colonies, ahem, “territories”, equality, etc.). We’ve done terrible things throughout the world and though we claim to worship the law, we only honor it when it applies to other countries and not to our own. We’re quick to mention the Geneva convention when it’s our soldiers on the line, but not when we’re violating that same convention with others. We expect the world to respect and honor our greatness, enraged when seeing others desecrate our symbols, but don’t really care about treading on those of others. The obsession with these symbols is relatively recent, most of them officially adopted within the last hundred years. The Pledge of Allegiance, originally written in 1892 (without “under God”) by a Christian socialist who wanted to instill loyalty to the United States in children, was officially recognized by Congress on June 22nd, 1942. Congress added the “under God” in 1954 thanks to a push by the Knights of Columbus, cementing the divine nature of the U.S. itself in the minds of every American schooled since. The national anthem was made official by Congress in 1931, having competed with other songs of the era, like “My Country, ’Tis of Thee” for popularity during official events. During the (baseball) World Series of 1918, the military band that played during the 7th inning played the song, uplifting everyone’s spirits, which were affected by World War I. Club owners saw this and how it brought people into the stands, so they decided to play it for the rest of the series and for special events. It didn’t become standard fare until post-World War II when the expensive band stopped being necessary as recordings could be played over loudspeakers. The games had become venues for patriotism. Vietnam had a huge influence in our religious devotion to ourselves. Losing the war brought great insecurity to the nation and we’ve been compensating for it ever since. At first we were angry at the soldiers, most of them teenagers drafted into the war, for they weren’t great enough to deserve our praise. But thanks to our celebrity saints and their films and TV shows, soldiers have now become our missionaries around the world, spreading the religion of our power. Our soldiers are now viewed as demigods to be worshipped. We must scream our prayers and thankfulness publicly and openly, and bow down because they chose to serve. Now, don’t get me wrong. It’s correct to support our troops. We hire them to protect us from our enemies, to fight for our interests, and to protect the rule of law, the Constitution and our republican form of government. They’re our team, our people, our defenders. It’s wrong that after Vietnam we didn’t do our best job of providing the support they needed. It’s right that we compensate for that… to an extent. I’m the first to support and rally for our troops, but unfortunately, our American religion has pushed that beyond any semblance of normalcy or reason, to the point that any criticism of the military, soldier behavior, or their out-of-control budget is outright sacrilege. Elevating the military to its current status is dangerous in a democracy, and President Eisenhower, an army general, warned against this back in 1961. We have the best rockets. We often criticize other countries, regimes, nazis or otherwise of their methods, of their obsession with military displays, with propaganda, with indoctrination, their out-of-control nationalism which punishes dissent and free speech, yet they’d be proud of us. We’ve turned brainwashed loyalty and patriotism into an art form, 2,160 times during our youth and at every event, national or otherwise, especially if sporting. Our religion of ourselves is overpowering, with its rightful president messiah at the head of the table. Its military might and worship, is as out of hand as our spending on it. Separation of church and state is no longer necessary when the official religion is the state itself. Enjoy this post? Be sure to share it, and don’t forget to support our veteran associations who help those who served and is the best “thank you” you can give our troops. Thank you for liking, following, and the rest of it. Be sure to keep up with everything Franco Esteve at www.francoesteve.com or on Twitter @FrancoEsteve and Facebook https://www.facebook.com/seefrancoesteve.